When I say “rotator cuff strengthening,” what’s the first exercise you think of? Those horrendously boring theraband exercises, right? Yes. Those. Boring band exercises are a great place to start with strengthening your #circusshoulder, but I’m going to operate under the assumption that you already DO those, or at least know that you should do those. This post will focus on the next step of rotator cuff strengthening that is slightly more advanced- and MUCH more functional to the demands we place on our rotator cuffs during training. 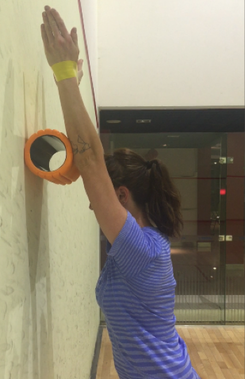 This Before I dive into the rotator cuff specifically, I want to talk a bit about different types of strengthening exercises, and their relevance to circus. The two types I’ll be discussing in this post are ISOLATION exercises and FUNCTIONAL exercises. Isolation exercises are when you perform a very basic exercise with the goal of either activating or strengthening one particular muscle. Isolation exercises are important because on occasion, small stabilizer muscles (like the rotator cuff) may be inhibited- not firing when they should be firing. This obviously causes issues. Performing isolation exercises is a great way to wake up and activate specific muscles- the focus here is on training MUSCLES more than MOVEMENT. “Functional” exercise is a WILDLY overused term in the strength and rehab industry. When I use the term functional, I am implying that it is an exercise that strengthens a region of muscles in a way that is necessary for them to activate during acrobatics, handbalancing, and aerial arts. The exercise strengthens all of the muscles necessary to safely perform some component of a common movement. Functional exercises train the MOVEMENT more than an individual MUSCLE. Now…moving on to the rotator cuff. Yeah, these are NOT riveting…and I bet we ALL have been guilty of sloppily rushing through them before class so our Russian trapeze instructor won’t yell at us for not doing our “bands.” NEVERTHELESS, they are VERY important. The reason I like them and force myself to suffer through them before every training session is because they “wake up” the individual muscles in the rotator cuff. 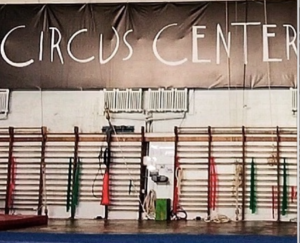 They’re our rotator cuff’s ISOLATION exercises, and a responsible circus artist who cares about their #circusshoulders does them before each training session, and does them with proper form. In my opinion, the most important rotator cuff band exercises are 1) shoulder external rotation at 0 degrees 2) Shoulder internal rotation at 0 degrees. 3) Scapular retraction plus shoulder external rotation at 0 degrees 4) Scapular retraction plus shoulder external rotation at 90 degrees. It was really tough for me to pick out only a few functional rotator cuff exercises for this section, because there are SO many variations. Obviously, it’s best to tailor them to YOU specifically, and choose each exercise based on your strength level, shoulder health, and specialty. Nonetheless, below are some of my favorites for acrobats, handbalancers, and aerialists. If you want your very own comprehensive, apparatus-specific functional exercise program, email me to set up a skype consultation. You’ll get a complete warm up and cool down protocol, along with an injury prevention circus strengthening program to be completed 3-4 times per week. ​All of these can be found easily on amazon with the above names used as search terms. This is one of my favorite progressions for rotator cuff strengthening. This exercise strengthens the large muscles of the shoulder, along with the parascapular muscles and the core. The miniband adds in a bias to the rotator cuff, specifically the infraspinatus and teres minor. The first variation is in a plank position. 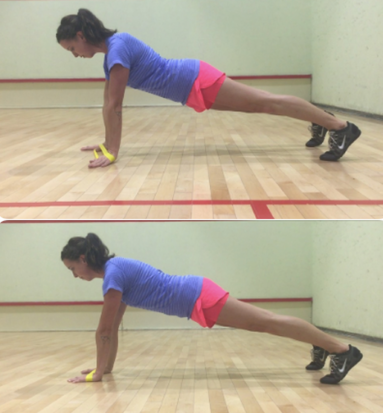 With the band around your hands, not wrists, start in a straight plank position. Feet wider apart is easier, feet together is more difficult, one foot lifted is ninja-status. Keeping your shoulders and hips parallel with the floor, take a small step sideways with your right hand. Rotate your arm slightly out, trying to initiate this rotation from your shoulder vs you wrist. Return your R hand to the starting position, repeat on the L.
Variation 2 is to do the same thing but in a “downward dog” position. Engage your upper traps in the shoulders-shrugged direction, as you would in a handstand. This is a nice progression to do if you have no issues with variation 1. It requires different muscle fibers of your rotator cuff to be active, and more closely mimics the requirements of your rotator cuff in a handstand. Obviously this is less of a core workout, so I like to do both of these variations in one session. 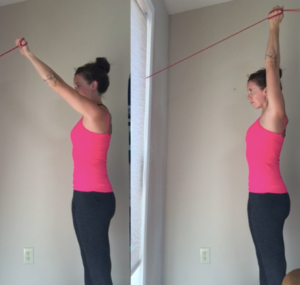 You’ll need a foam roll and a mini band for this exercise (or a light theraband you’ve tied in a loop. 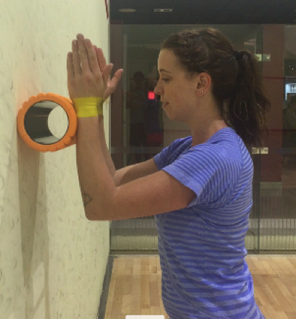 Start with your hands at eye level, foam roll between wrists and wall. Throughout the exercise, fight to keep your elbows directly under your wrists. Slowly slide your arms up until they are straight, and lean slightly into the foam roll. KEEP YOUR RIBS IN! This is great for training the muscles of the rotator cuff along with the serratus anterior, another muscle thats vital for shoulder health. It’s also a great active flexibility exercise for your lats…IF you keep your ribs in and lumbar spine neutral. This is another multipurpose exercise: GREAT for active lat flexibility, but as a result also requires concentrated effort in keeping ribs in and back neutral. Start standing with a theraband anchored to stall bars or something equally fixed. Start with your arm straight, palm forward, and arm lifted to about 140 degrees. Simultaneously rotate your shoulder out (into external rotation) as you bring your arm into as much elevation possible WHILE keeping ribs in. Slowly reverse to starting position. To get maximal rotation benefit, you’ll want to wrap the band around your hand at the start of the exercise. Level 1 is doing this one arm at a time, level 2 is doing both arms together. I recommend using the rotator cuff isolation exercises as one of the first parts of your warm up. Its a great way to activate these muscles before you start training. The functional exercises can also be integrated into your warm up. As a general rule, I recommend two sets “to fatigue” on both sides (with light resistance!!). I’ll also use the functional exercises as part of a circus-specific injury prevention strengthening plan to be performed several times per week – either on a no-training day or after a light training day. In this scenario, I like to add them into a circuit of exercises, either done in 3 sets to fatigue, or for timed intervals. All of the exercises I suggest in my blog are for the NON-INJURED, NON-PAINFUL shoulder. If you have pain during training or daily life, SEE A PHYSIO! We can help you with that. If you have pain during these exercises, don’t do them. You should feel most of these exercises working the muscles on the back of your shoulder and shoulder blade. If you feel pinching on the front or “inside” of your shoulder, see a physio!